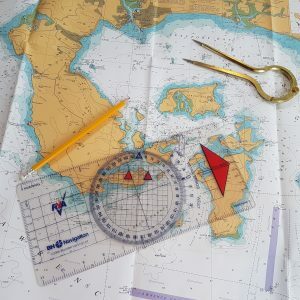 RYA Essential Navigation & Seamanship Course is a basic introduction to navigation and safety for anyone new to boating: sailors, power boaters, sea anglers, divers and boat masters. Also useful for experienced dinghy and keelboat sailors and inshore racers. Spend a relaxed 2 days in our spacious classroom with one of our friendly instructors who will guide you through all you need to enhance your boating knowledge. The course covers charts and publications, safety, buoyage, tidal awareness, basic navigation and pilotage, rules of the road, electronic navigation, anchoring, weather forecasts, and passage planning. The aim at the end of the course is to get you to a level where you have a basic awareness and understanding of navigation and safety. Course materials, Charts, Chart plotter simulators, Plotters, Dividers, Compasses, Tea, Coffee. We will guide you through all you need to enhance your boating knowledge. The course covers charts and publications, safety, buoyage, tidal awareness, basic navigation and pilotage, rules of the road, electronic navigation, anchoring, weather forecasts, and passage planning.